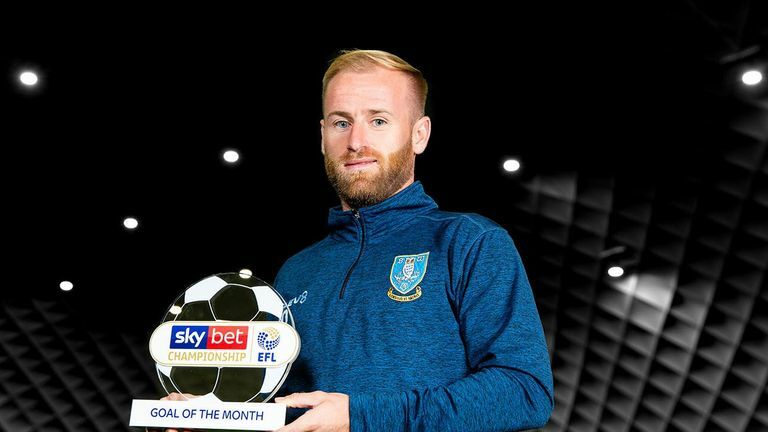 Sheffield Wednesday midfielder Barry Bannan is the Sky Bet Championship Goal of the Month winner for August, receiving 63% of the public vote. Millwall partially cleared Adam Reach's cross but it fell to Bannan, who sent a stunning "once-in-a-lifetime" left-footed volley past the goalkeeper from outside the box. "I have not scored for a while, so the celebration wasn't a great celebration because I am not used to it, but I will work on that! It is just one of those ones that happens once in a lifetime and luckily for me and the team, we got the three points and it went in. Bannan said: "I think that has been the best goal I have scored in my career. We were pressing in the game and I just remember trying to get into the box a few times just before it. I think Reachy [Adam Reach] might have broken down the left and put a cross in, and it broke between me and Marco [Matias]. Luckily, I got there first and everything from then was just like a blur. "I have not scored a bad goal since I have been here and probably that is what I need to start doing - scoring a few bad ones and getting my tally up. I will shoot as much as I can this season, I want to score goals, so hopefully another few can fly in like that. But I don't think there will be many better than that." Lead Sky Bet EFL Goal of the Month judge and Sky Sports pundit Don Goodman said: "Barry Bannan doesn't score too many goals - but when he does they tend to be absolute screamers. This was a stunning strike, which flew in and gave the goalkeeper no chance whatsoever. "The technique he showed, to control the shot and keep the ball under the bar, was fantastic. I'm not sure we'll see too many better volleys from that kind of distance this season." Bannan beat off competition from West Bromwich Albion's Harvey Barnes and Brentford's Ollie Watkins. 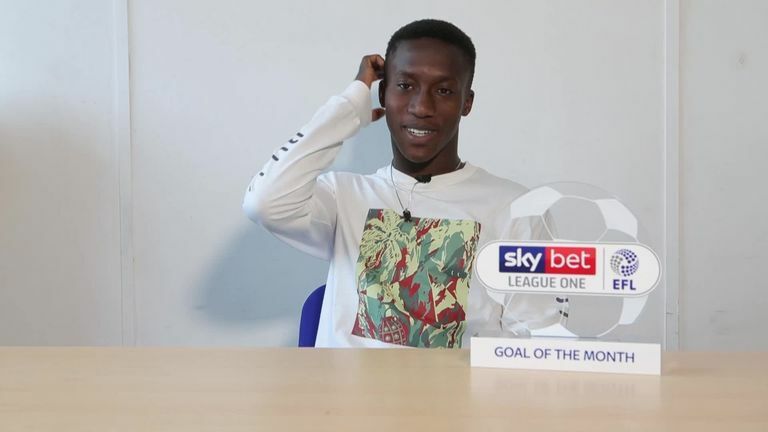 Peterborough forward Siriki Dembele is the Sky Bet League One Goal of the Month winner for August, receiving 55% of the public vote. Collecting the ball just inside the Luton half, Dembele attacked with real purpose - and, when it appeared he had been fouled on the edge of the box, he picked himself up, pushed the ball between two defenders and lashed it beyond the keeper for a wonderfully improvised goal. "I thought I could have played on, and you have just got to play on until the ref blows his whistle. I am hoping I score lots more goals and help the team out in every way possible. We are at the top at the moment and we want it to stay that way so we will do everything possible to keep pushing and keep winning every game that we can." Goodman said: "This was such an unconventional goal but showed Dembele's determination and improvisation. "Most people in the stadium probably thought he had been fouled just outside the box. But he played to the whistle, got back on his feet and finished with real confidence to cap one of the more unusual - but no less impressive - Goal of the Month winners we have seen." Dembele beat off competition from Gillingham's Luke O'Neill and Barnsley's Dimitri Cavare. 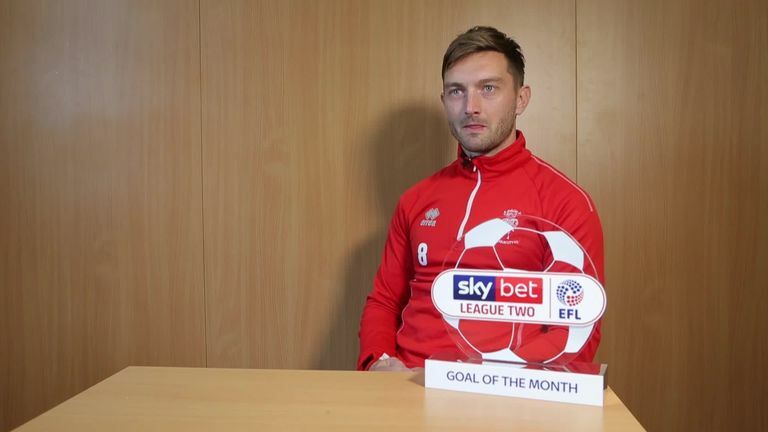 Lincoln City midfielder Lee Frecklington is the Sky Bet League Two Goal of the Month winner for August, receiving 60% of the public vote. The build-up to Frecklington's goal was somewhat chaotic, with Notts County twice half-clearing the ball - but the finish itself was cool and composed, Frecklington side-footing a delicious volley into the corner from 25 yards. Frecklington said: "That is one of those that don't happen very often in your career. To execute it like that, and for it to go exactly where you want it to go, it doesn't happen very often, so I was really pleased to see it go in. "As a midfielder, you often find yourself in that position on the edge of the box waiting for the ball to hopefully get knocked out. As it is coming down out the sky you are thinking 'I want to volley this', and as it drops I am thinking about lacing it, but at the last minute just decided to try to side-foot it. Sometimes you are a bit more accurate with that, and I was lucky that it went exactly where I wanted it to. "I would like to think there will be more goals but whether I will hit any as sweet as that I am not sure. But I will definitely be doing my best to try and get a few more." Goodman said: "The build-up to this goal was scrappy to say the least - but Frecklington's powerful, cool and composed volley was anything but. It's a delightful shot - and Frecklington knew it was going in as soon as it left his foot; he was turning around to celebrate the brilliant strike before the goalkeeper had finished his dive." Frecklington beat off competition from Tranmere Rovers' James Norwood and Stevenage's Michael Timlin.